Our Secret - We know something about you that you probably don't even know about yourself. Click to see how you can get a custom relationship guide today. Start by answering a series of questions, then you'll get a report tailored specifically to your relationship. Invest in your relationship today. When partners handle their finances in different ways, they can stress their relationship, and that can lead to a breakup. Takes Two gives you tips for working together on your finances and eliminates one of the biggest problems for couples. Whether we like it or not, we all need to get stuff done around the house. Sometimes one of the best things about knowing the way you naturally take action is that you can make annoying stuff (like chores) less annoying. Your words and actions are speaking - loudly. Takes Two helps you understand one another's styles for taking action and helps you communicate in ways that work. 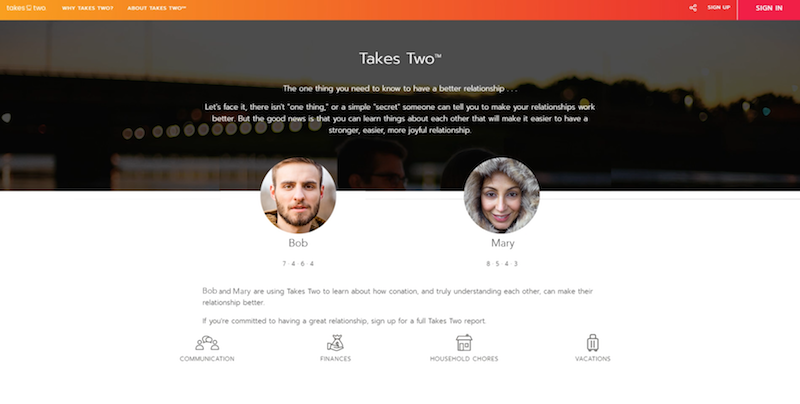 Takes Two is a fun and fast way to learn about each other. You'll get tips to work better together and learn what to let go of, and what to hold on to.